The CSIR’s achievements over the years are attributed to its greatest asset, its people. If you are looking for a career with a leading science organisation that believes in developing and growing its employees, then the CSIR is the organisation for you. Our strength lies in the quality of scientists, researchers and support staff we attract, the opportunities we create for career development, our commitment to excellence and working together to create a better future through science. Below we highlight why you should join the CSIR and the career development paths available for you at the CSIR. The CSIR’s career ladders for research and personnel development provide researchers with growth opportunities, while developing their expertise, gaining experience and growing their profiles. Researchers are afforded a robust and transparent process to measure their progression and reward their career advancement from junior (candidate researchers) to very senior levels (principal and chief researcher levels). 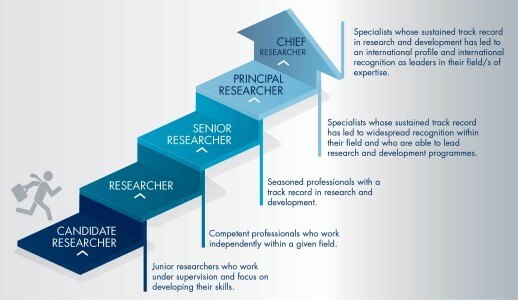 The career ladder for CSIR researchers has five levels and researchers will be promoted from one level to the next as they gain experience and skills. Advancing up the research career ladder is usually done in step-wise increments, which provide the opportunities to increase either technical or managerial aspects of the job, which are both necessary. Completing a PhD or finalising the publication of results from a completed research project, are examples of advancing in terms of technical skills and experience. 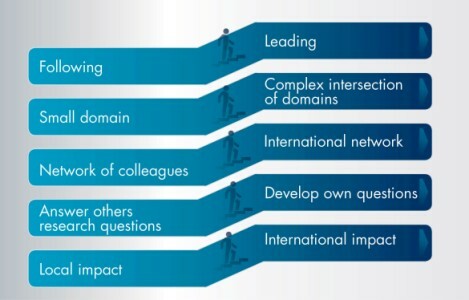 Managing a challenging research project or assuming responsibility as a research group leader, are examples of advancing in terms of management and leadership. From time to time, researchers should assess where they are in terms of this model and should look for opportunities to gain appropriate experience.